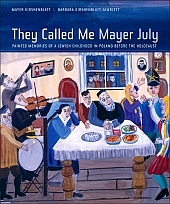 They Called Me Mayer July: Painted Memories of a Jewish Childhood in Poland Before the Holocaust by Mayer Kirshenblatt and Barbara Kirshenblatt-Gimblett. University of California Press, 2007. Exhibitions: The Jewish Museum (New York), May 10-October 1, 2009 | Jewish Historical Museum (Amsterdam), fall 2009. Mayer Kirshenblatt is a self-taught artist living and working in Toronto. Born in Apt (Opatów in Polish) in 1916, he arrived in Canada in 1934 at the age of seventeen. After apprenticing to an electrician and cobbler in Poland and working in a sweatshop in Toronto, he painted houses and eventually opened his own wallpaper and paint store. He retired in 1977. In 1990, he began to paint everything he could remember about his hometown and his childhood there. Videos of Mayer. Barbara Kirshenblatt-Gimblett began interviewing Mayer in 1967 and has continued to do so until the present. She is University Professor and Professor of Performance Studies at New York University. 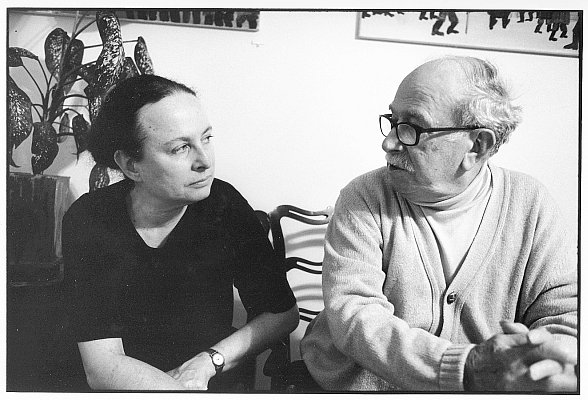 Read her account of their forty-year collaboration: A Daughter's Afterword. BKG: How did you get the nickname Mayer July? 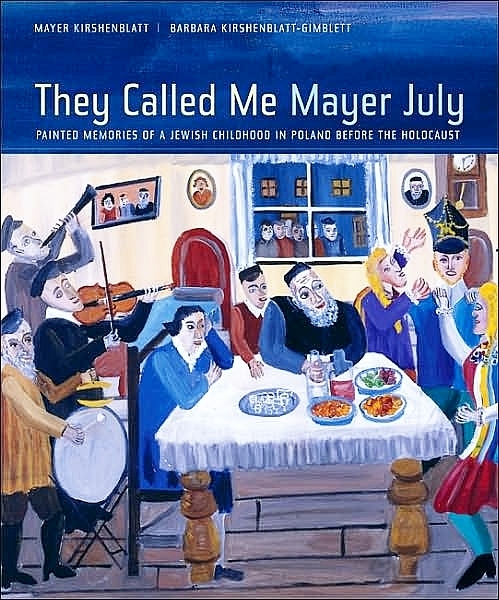 MK: I was named after my great-grandfather Mayer Makhl Gutmacher. Everybody in town had a nickname. Mine was Mayer tamez, Mayer July, because July was the hottest month of the year. Mayer tamez means Crazy Mayer. People get excited when it is hot, and I was an excitable kid. I was always on the go. I was very smart and very hyperactive. Of course, they wouldn’t call me Mayer tamez to my face. They were afraid to do that. There were a bunch of Mayers. So to tell them apart, each had a nickname. Which Mayer do you want? Mayer tamez? Mayer treyger, Mayer the Porter? Or Mayer droybe, Mayer the Goose Carcass? I was just different and still am to my contemporaries. I was small, I was picked on. If anyone started up with me, I grabbed whatever was handy. “Stay away from Mayer tamez, meshigener Mayer, Crazy Mayer.” I was quite rebellious and I spent quite a bit of time by myself doing whatever I was interested in. BKG: I was shocked to find out you failed a grade of Polish public school. MK: I played hooky. I was too busy watching everything that was going on in town. I would spend hours observing the blacksmith and the tinsmith, the ropemaker and the cooper, the mills and the carp ponds, and the town square on market day, when all the peasants came to town. That's how I know about all the things I've described to you. BKG: How did you start painting? MK: I started painting in 1990, when I was seventy-three years old, at the urging of my family. My wife had been begging me for ten years to paint and your husband, Max, had kept buying me art supplies. You kept pleading with me to paint what I could remember. Everyone kept cracking the whip. I finally relented. 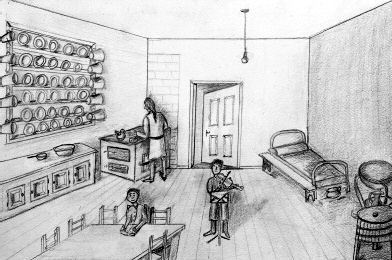 My first drawing was of my mother’s kitchen in Apt (Opatów in Polish). I drew it for you. BKG: Why do you paint? MK: I consider myself a storehouse of memories. My project is to paint prewar life in a small Jewish town in Poland. That’s what really interests me. The way I paint is important, of course, but the most important thing is to get a subject. I have to get a subject. I think about it. I remember. It just comes to me. The subjects I decide to paint are those that have a story to tell. I draw mainly from my memory. I also paint stories I heard from my Apt friends or read in the Apt chronicles, the memorial book for my town. What I am trying to do, basically, is not to glorify myself but to portray life as it was. I hope it gives you some idea what life was like.The places I remember exist no more. They are only in my head, and if I die they will disappear with me. I paint these scenes as I remember them as a little boy looking through the window. BKG: Why did you leave Poland? MK: My father left Opatów in 1928. There was a lot of unemployment at the time, and Jews were discriminated against. I always considered myself a Pole: I was a Polish citizen, went to a Polish public school, and was steeped in Polish literature and history, but the Polish government did not consider me a Pole; they considered me a Jew, a żyd, which sounds horrible. The reason I left Poland was basically economic. I just could not see any future in Poland. I was a Zionist, so Palestine was an option, but it was hard to get permission to go there and my family had been immigrating to Canada since 1905. So we settled in Toronto. BKG: What was it like visiting Apt more than sixty years after you left? MK: When you asked me to go to Poland with you around 1981, I adamantly refused. A few years later, I changed my mind and looked forward to visiting my birthplace. Around 1990, when I visited for the first time, my heart was pounding as we approached the town. On entering Apt, the first place I wanted to see was the place where I used to live. It was gone. The visit made me very sad. After five hundred years of Jewish habitation in Apt, there was not a single sign that Jews had ever lived there. The second time I visited, in 1995, I brought snapshots of my paintings and talked to people on the street. I made friends with people living in Apt today and have stayed in touch with them. They are very interested in what I can remember about Jewish life in Apt before the Holocaust and want to exhibit my paintings. BKG: How do you feel about what you have accomplished? MK: How satisfying, particularly at my age, to have found my calling. I feel that my paintings expose a whole new world that nobody knows except me, the friends of my youth (most of whom have passed away), and people from my town who survived the Holocaust. What I’m trying to say is “Hey! There was a big world out there before the Holocaust.” There was a rich cultural life in Poland as I knew it at the time. That’s why I feel I’m doing something very important by showing what that life was like. It’s in my head: I will be gone, but the book will be here. They didn’t call me Mayer July--Crazy Mayer--for nothing. faxless payday loan on Become a fan of Mayer July on Facebook!